We had so much fun counting the days until Meet Magento Germany 2017. Everywhere you got reminded by “Only xyz days left until MM17DE.” We were so excited and full of anticipation. Now it’s over and counting the days after MM17DE makes not that much fun. But depression is not the only emotion we feel after MM17DE, we are also very proud of the conference. The 11th edition of MMDE was the biggest in its history. We expected 650 attendees and you exceeded all expectations. Til Monday morning we still sold tickets! Everyone wanted to be part of the community event. At this point we would like to thank you all for a great event. We are truly thankful for everyone who attended the conference, because you guys make the conference what it actually is. We also want to thank our sponsors for make this event even possible. Also a very big thank you to all Meet Magento Association Partners, to all Magento employees, who came from all over the world and to all speakers, who share their knowledge with us. Another big thanks to the whole pentahotel staff, you made us feel very welcomed, the technicians, who made sure we had no technical disaster and to et solution, that did a great job by deliver a great wifi connection so every tablet, smartphone and laptop could work properly. Thank you all for coming and making MM17DE to the biggest Magento conference in Germany. Traditionally the Firegento Hackathon took place the weekend before the conference. The extended version of the “Magento Weekend” started on Friday with the official Hackathon Pre Party at Pizza Lab, which is located in an urban area in Leipzig. While eating vegan pizza, you could meet old and new friends. On Saturday and Sunday the Hackathon took place in Plagwitz (Leipzig). One highlight at the Hackathon was the Magento Contribution Day – a format which was created by Magento and Meet Magento Association and which will take place at every Meet Magento conference worldwide. Magento Director of Community Engineering Max Yekaterynenko and his team worked together with a group of community developers on different Magento projects. During the breaks you could improve your skills in archery and table tennis, relax or eat a lot of junk food. Thank you very much to Firegento, especially Claudia, for the great organization. On Sunday (May 21) the partner agencies of the Meet Magento Association packed their bags and set out for Leipzig, where the first partner day took place. With a great view over Leipzig the exchange of experiences, as well as the formulation of strategy goals of the MMA was much more easier. Together with Max Yekaterynenko, Magento Commerce, the attendees discussed problems of Magento 2, as well as getting new input for their daily business with the Magento shop system. Meanwhile our team finished the last arrangements in pentahotel for MM17DE. At 7 pm we opened the doors for sponsors, speakers, MMA partner agencies and the Magento team for an informal dinner. There everybody got in the right mood for the next two days. Afterwards we can say that one day got better than the day before. One highlight followed the next and we were right there in the middle. On Monday morning the conference started for all attendees. We were so excited and happy that the day had come which we worked for such a long time. Different meanings, new entries and developments gave distinction to the performance and the program of the conference. Our cooperation with Magento had also a great impact on the content of the conference. 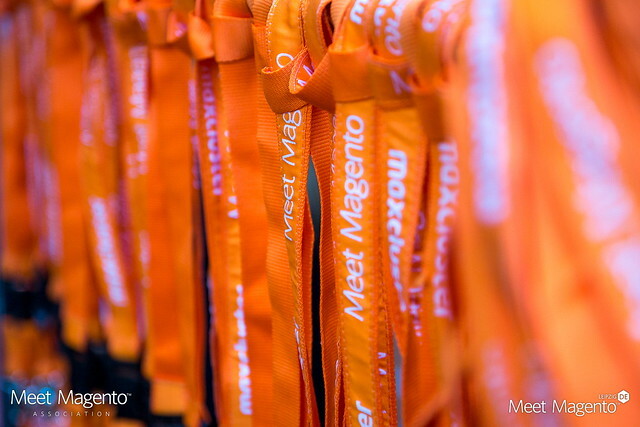 Impressions and trends at Magento Imagine in April also affected our conference. Magento itself made clear how important the German market is, by sending 20 Magento employees and the holding of two Keynotes by Paul Boisvert, VP of Product Management and Mark Lavelle, CEO Magento Commerce. Right after opening Paul introduced the product portfolio of Magento, especially Magento for B2B, Magento Social etc. CEO Mark Lavelle himself delivered insights into the future and the vision of Magento. According to Lavelle, Magento expects an increase in sales of 14 billion dollar, until 2020. Furthermore he paid tribute to the work of the German Magento Masters, mentioned the huge influence the Magento community has and announced that they expect a number of 500.000 Magento developers in 2020. Our big aim for MM17DE was to connect all the different groups of attendees at the conference. We wanted everybody, doesn’t matter if merchant or developer or something else to be satisfied at the conference. Every attendee should be able to collect impressions for their own business development. Therefore we arranged more than 40 speeches and 15 workshops which took place in 5 session rooms. The main topics at the conference were ERP, Digitalization, Security, Magento 2, Connected Technologies, Sustainability in E-commerce, Logistic & Fulfillment, Internationalization, Content Marketing, Growth Hacking, SEO and much more. This year’s agenda was not only created by us. The attendees had a great impact on it. To create an interesting agenda for the developers, the Magento community could decide which speeches they wanted to hear. To create the merchant track, different online merchants were interviewed. Therefore we made sure that Magento Community merchants as well as Enterprise merchants could advance their opinion. Another factor which influenced the program and the type of attendees as well was the cooperation with Bundesverband Onlinehandel e.V. (BVOH) and Bundesverband E-Commerce and Versandhandel Deutschland e.V. (bevh). Cooperations with E-commerce associations are totally new in our history. Another highlight for merchants was the Merchant to Merchant session. Within this new format four merchants (Kneipp, e.GO, I Am Mortal and Orwo) introduced their ideas, told about occured challenges, strategies and projects. On Tuesday the moment everybody waited for was there: the second Meet Magento Award ceremony. A jury consisting of 15 e-commerce experts evaluated shops regarding idea, usability, design, performance, targeting and product presentation. Because the online shop for outdoor fitness training was the winner in three categories, it was not a big surprise that Original Bootcamp and the agency basecom were the winner of the award. We take our hat off and compliment Original Bootcamp on the first place. The winner of the second place was Little Lunch, a producer of bio soups and smoothies and well known because of their participation in the German TV production “Die Höhle der Löwen”. Pinkmilk, an online shop for interior and decoration snatched the third place. Not only the owner of the online shop was pleased about their prize. The agency TUDOCK, which built up the shop, was also very happy. Because we were already in the mood for giving awards, we jumped at the opportunity and introduced a complete new format: The Meet Magento People Award. Every year we would like to stand out a person who plays an important role for Meet Magento Germany. The first Meet Magento Award ever goes to Rico Neitzel, one of the founders of Meet Magento. We would like to thank you for all your creativity, engagement, your passion, new ideas and their realization. At the end: some things don’t need to be changed – for example the after-show party at the Moritzbastei. Thanks to our loyal sponsor maxcluster and all the attendees who rocked the dancefloor and celebrated until the morning came.